I have brown rice, oats, pasta and misc items (granola bars and a couple other loose items that I didn't want laying around on the shelves).. 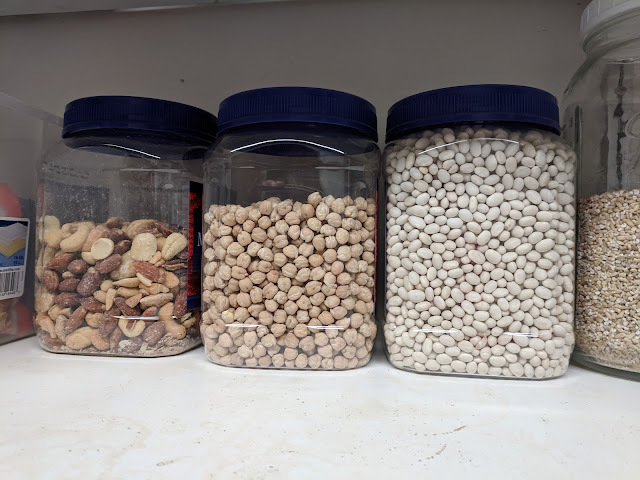 I have the mixed nuts in the first one :), garbonzo beans and small white beans in the other others. I recently, this year, started buying coffee in 3lb cans. I have kept a few of these, not sure how I might use them and don't want to end up with a basement full of them! :). For this project I had a great use for them. I had half (or maybe less) of a large box of Swiss Miss coco packets. I wanted to get the box off the shelf because it was big and taking up unnecessary space. I put the coco packets in the coffee can. And to make sure I didn't forget what was in there I labeled it. To label it all I did was cut the Swiss Miss logo off of the box before throwing it away and taped (with clear packaging tape) the label onto the coffee can. 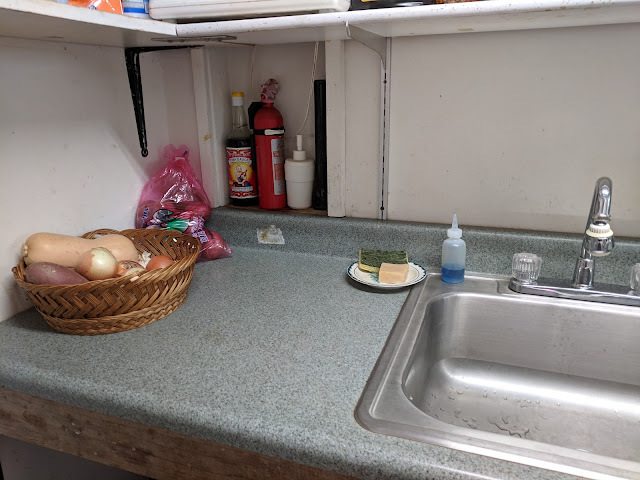 Now if I'd had more time I would have first painted the can or covered it with contact paper to make it look nice on the shelf. I may still do that, but for this day my main goal was not be distracted by projects like that and just get the main project completed. 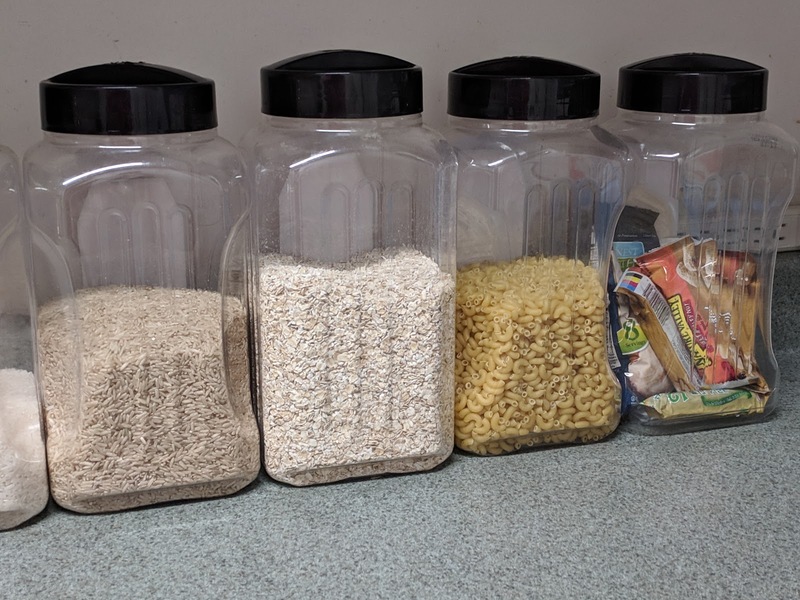 Next in line for favorite reuseable containers are canning jars!! I have tons of canning jars. 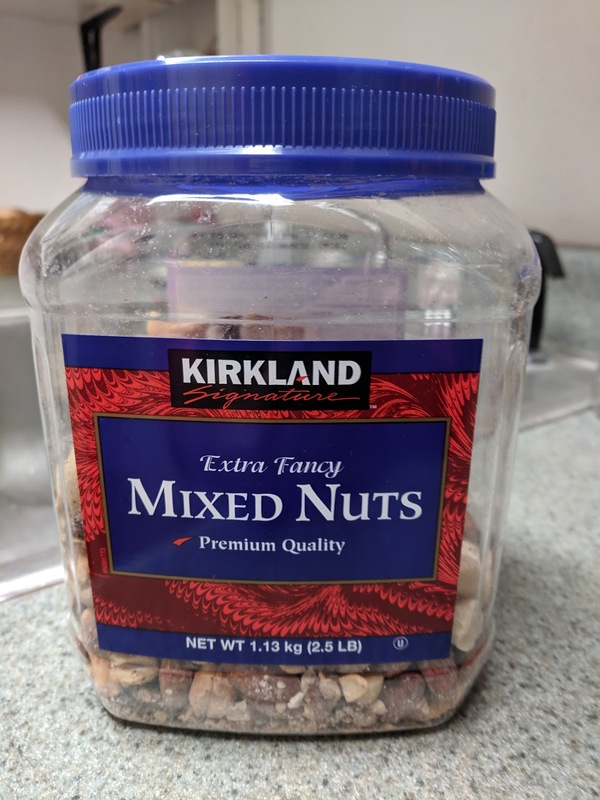 My two sizes that I prefer are 1 quart and 2 quart jars.. 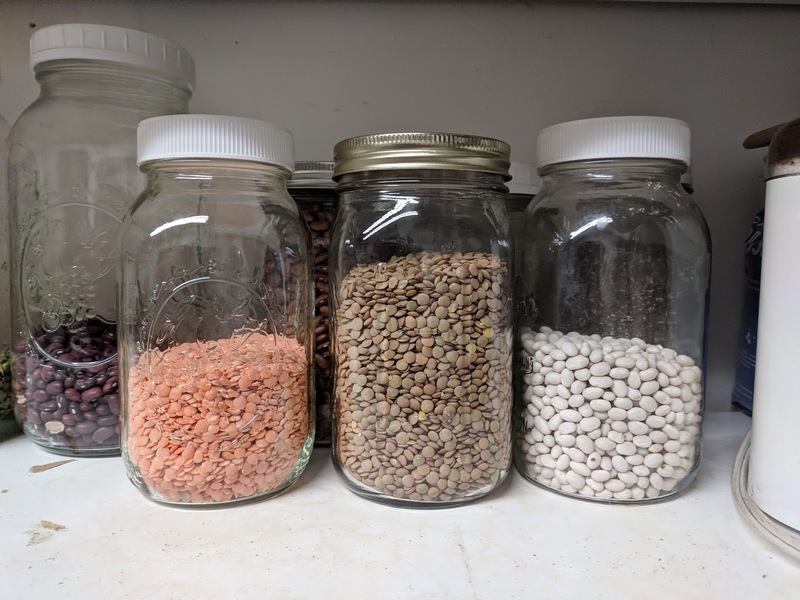 In the 1 quart jars I have red lentils, brown lentils and some more white beans behind them are 3 more jars with chia seeds, pinto beans and sesame seeds. 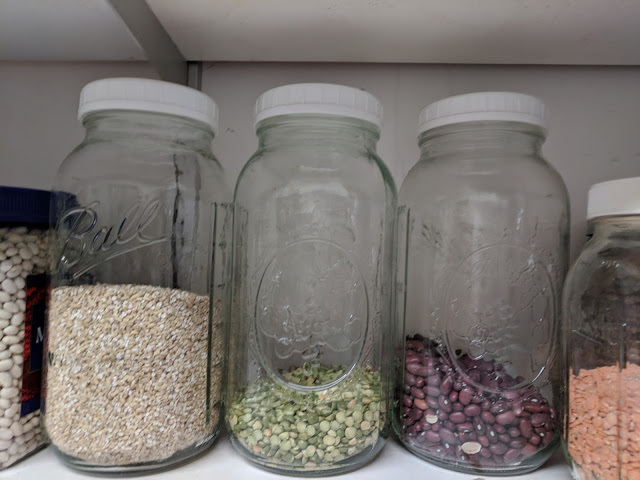 In the 2 quart jars I have steel cut oats, split peas and red beans. 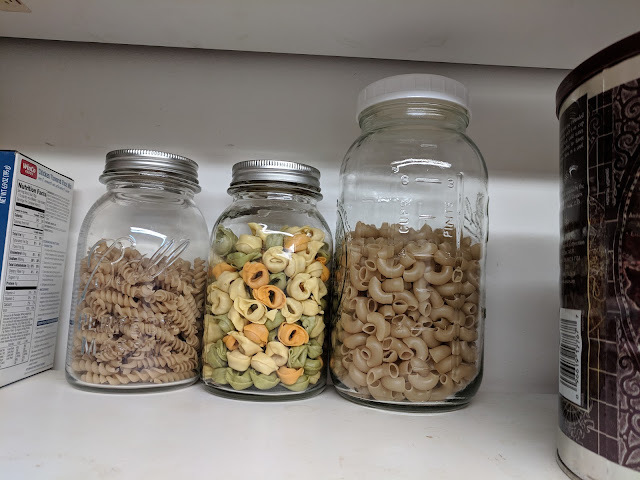 On another shelf I have brown rice pasta and tortellini pasta in them. 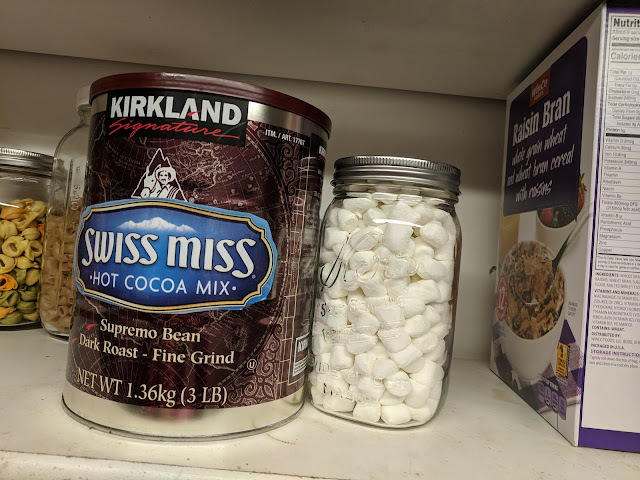 And of course you saw my canning jar full of marshmallows next to the coco mix. 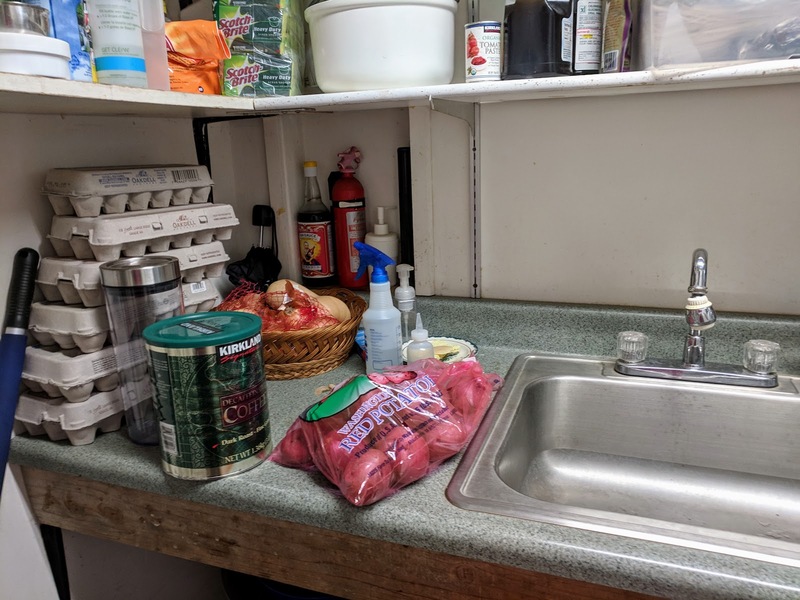 Now that you've seen the containers I used I'll show a few before and after pictures of the whole project..
And beware!! I told you it was a mess, and it was a big mess on this day!! 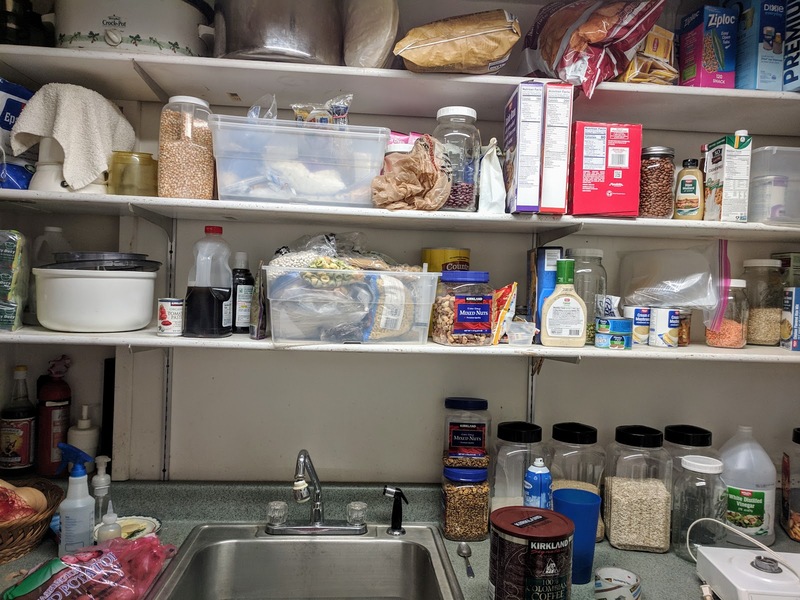 I should note that I keep my canned goods on another shelf in my basement. 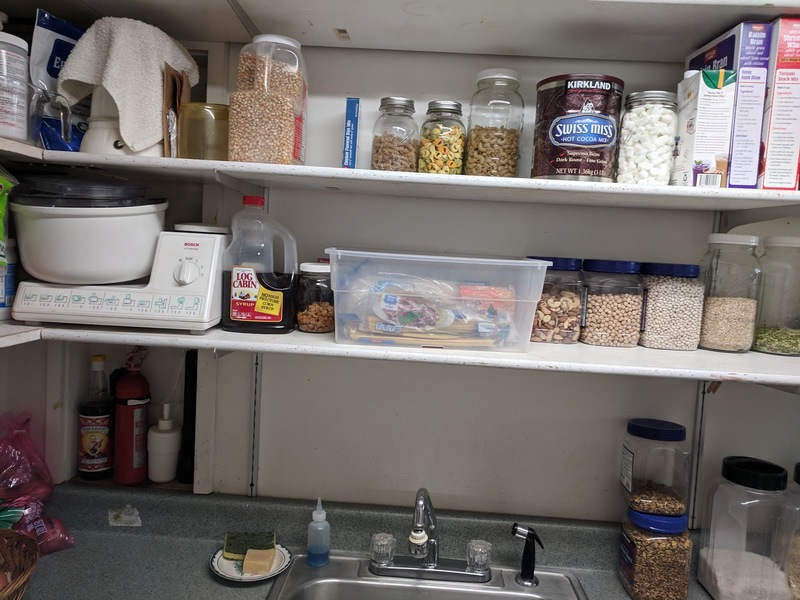 It's a smaller shelf (for the store bought canned and bottled goods) and another large shelf for my home canned foods. I did not do any canning this year so that shelf is sitting mostly full of empty canning jars. 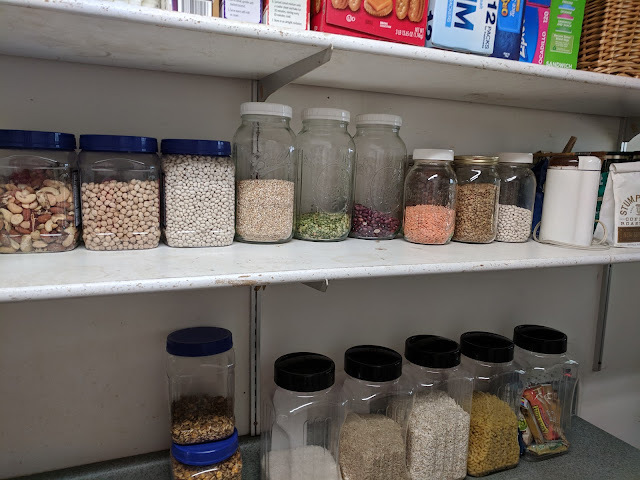 I hope this post encourages you if you need to do any organizing and lets you think about what you might already have in your home to work with. Is that the kitchen sink? 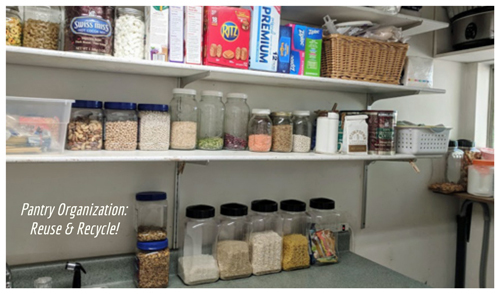 Looks like your pantry is right in the kitchen where one might otherwise find kitchen cupboards is instead made into your pantry. I used to have a bigger and full pantry but since the kids grew up and are mostly on their own and not at home very often, I'm trying to reduce my pantry supply. 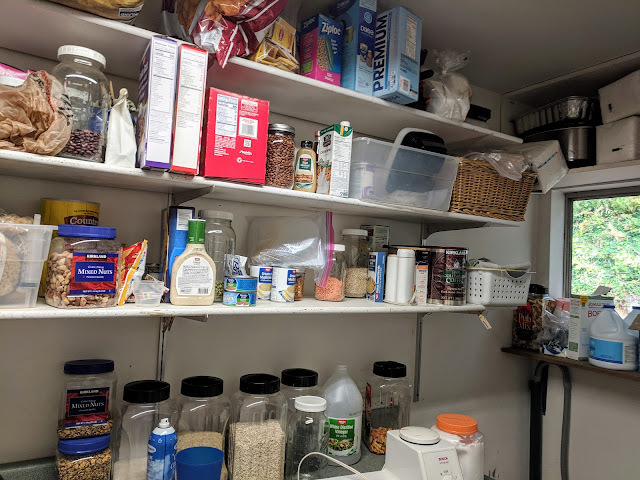 It's still a full pantry and I like it so I don't have to run to the store for every little thing! 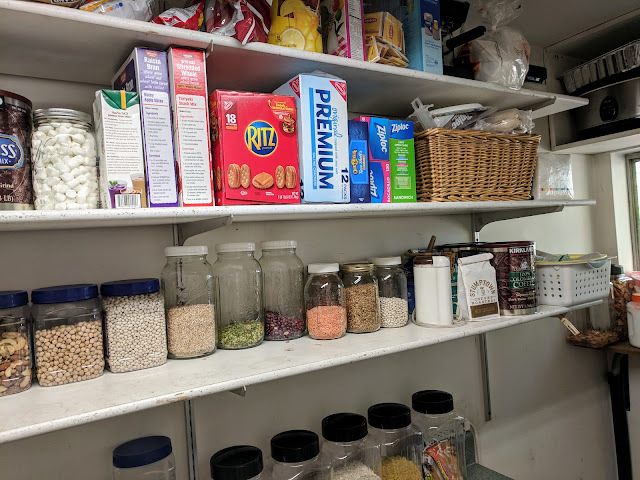 My adult children use coffee creamer....the big containers, and I find them a neat way to store items especially things you would like to be able to pour. They use so many I wish I knew of more creative ways to use those bottles! Your pantry looks amazing. 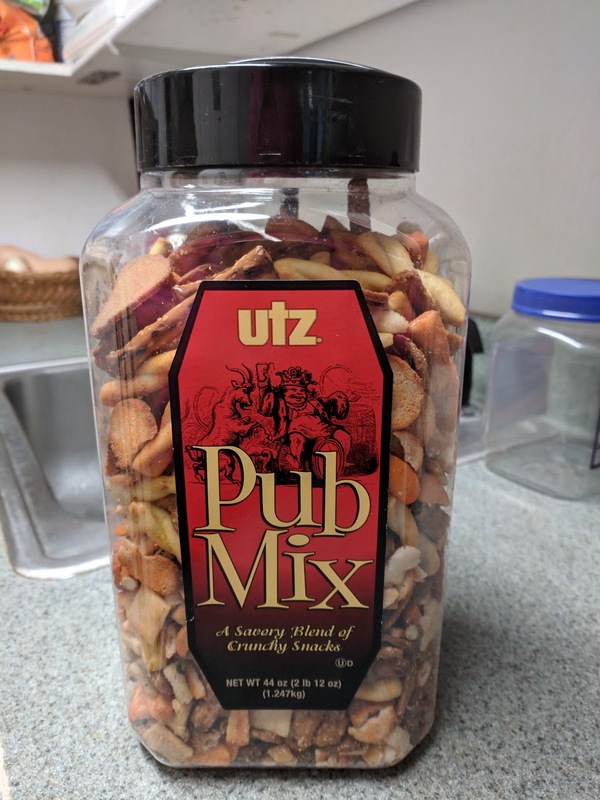 What a great idea to recycle what you already have. Impressive!